Thursday August 1st 1878 I finished up my dress this morning and cut and made Rob a dark shirt before dinner. As soon as I had eaten I dressed and went down the river to invite the ladies to spend tomorrow afternoon with Mother. I then went on to Lathrops where I spent a pleasant afternoon. Did not get home till evening. A year ago tonight was the last time Maggie was here. 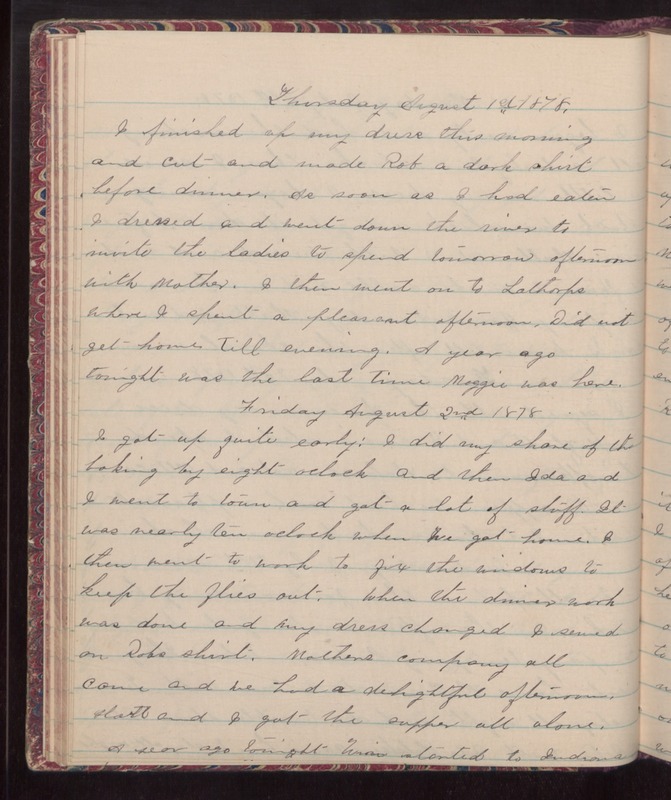 Friday August 2nd 1878 I got up quite early: I did my share of the baking by eight oclock and then Ida and I went to town and got a lot of stuff. It was nearly ten oclock when we got home. I then went to work to fix the windows to keep the flies out. When the dinner work was done and my dress changed I sewed on Robs shirt. Mothers company all came and we had a delightful afternoon. Hatt and I got the supper all alone. A year ago tonight Win started to Indiana.